3. 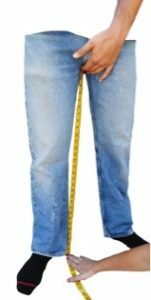 Actual Waist ( Waist size marked on a pant can be correct or up to 6 inches different than the actual waist measurement, so it is very important to measure the waist.) 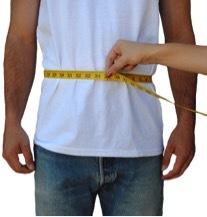 If the belly is more than 2″ larger than the waist we also need the belly measurement. 4. 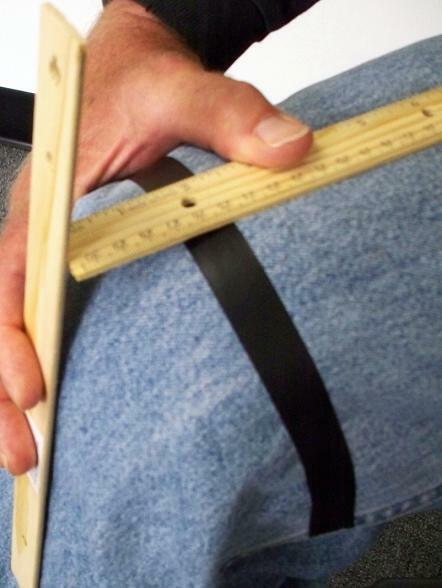 Belly measurement if it is 2″ larger than the waist. 7. Crotch to start of knee armor. (For proper knee armor location.) 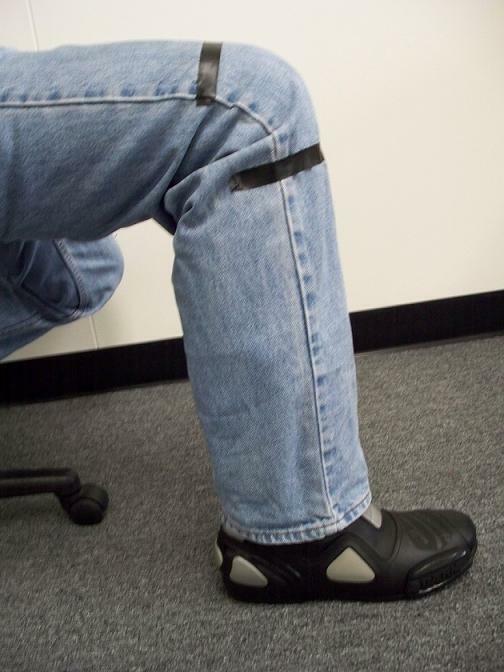 It is almost impossible to find a production pant where the knee armor fits perfectly on the knee cap when in a riding position. Knee/shin is one of the highest initial impact areas of the body in a tumble. If the armor floats up and down in the pocket, it will not stay in place upon impact. If the armor can be adjusted with Velcro, the Velcro can detach in a tumble. 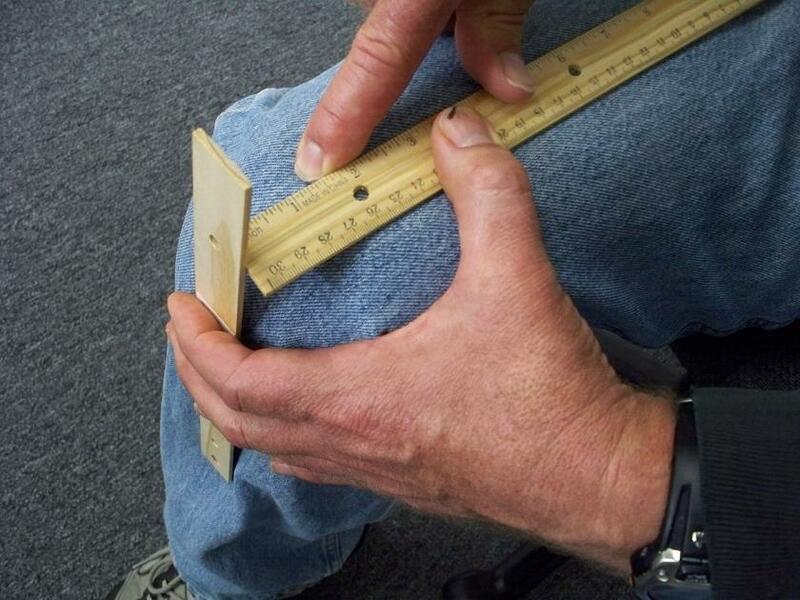 Straighten the knee. From the top tape line go down the leg 5 inches and put another tape line. You have just marked where the knee armor will go. 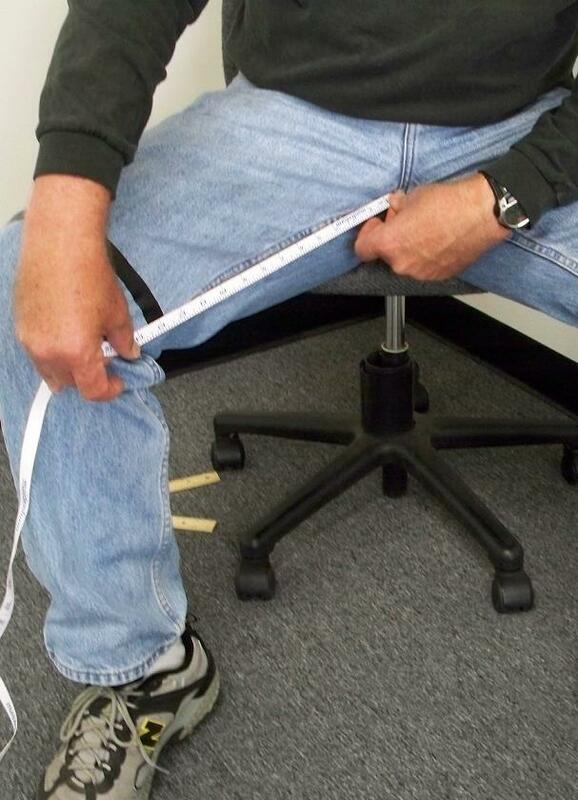 Measure from the crotch of the pant, where all the seams intersect, down to the end of the cuff. Add more if the jeans are too short for riding. Deduct any amount if the pant is too long. 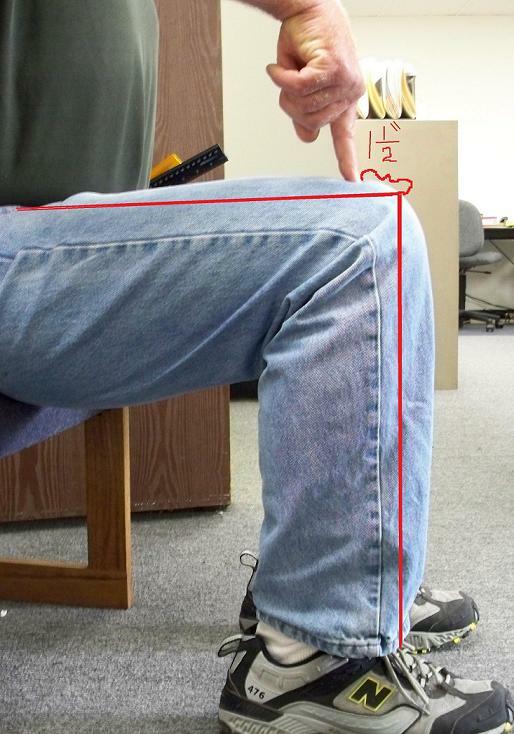 Note: It is important to measure for inseam length sitting with the legs straight as shown. 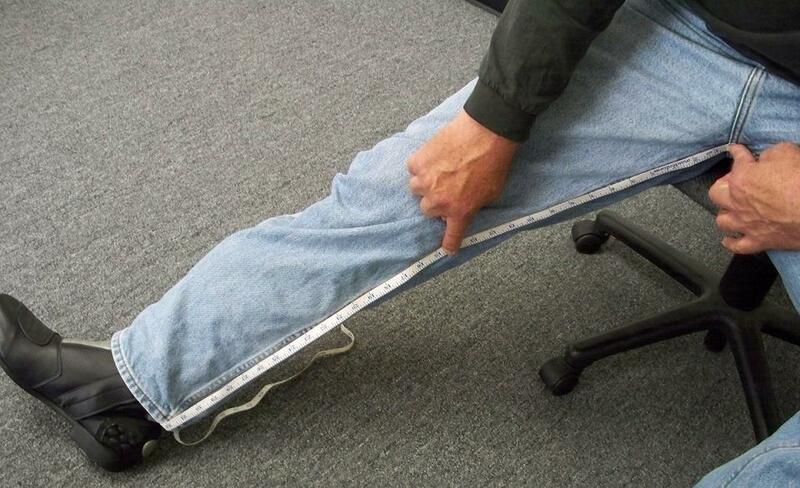 Denim pants will wrinkle up and many riders add inches longer than the denim pant. Our pant doesn’t wrinkle, measuring with the leg straight helps to take out the wrinkles to get a more accurate inseam length. When your foot peg position is farther back and the knees are bent more than a 90 degree angle, mark the pant the same way as shown above. Then move the feet further back to your foot peg position. You will notice how the Crotch to Start of the Armor mark, 1.5″ above the top of the knee will start to move forward. 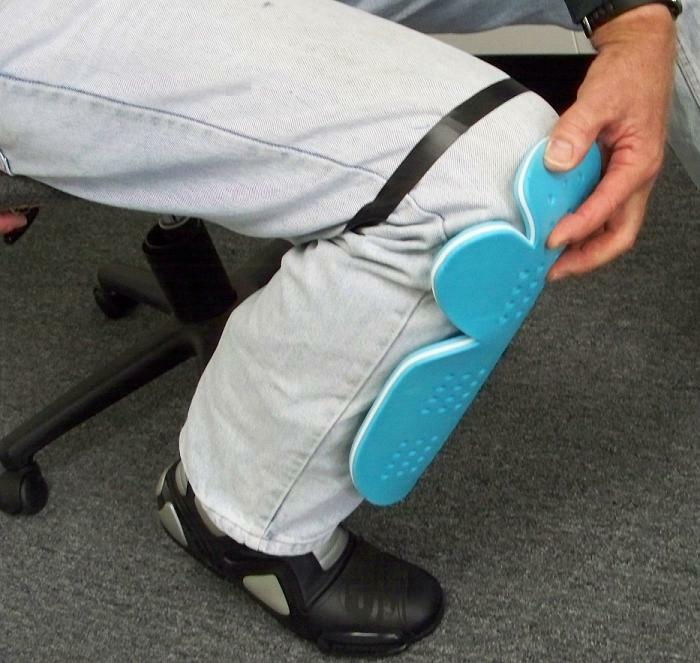 The knee/shin armor needs to be a little lower on the leg when riding bikes that have the foot pegs more to the rear of the bike. Marking the jeans first as shown above allows you to know better where the pant needs to be marked for your individual foot peg position. The photo above shows knees further back in an average sport bike foot peg position. You can see the tape line at an inch and a half back from the top of the knee where the armor has moved down the leg. 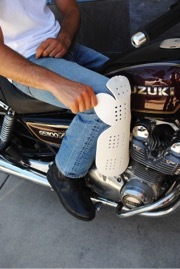 With most sport bike boot position lowering the knee armor 1″ to 1.5″ is an approximate average. 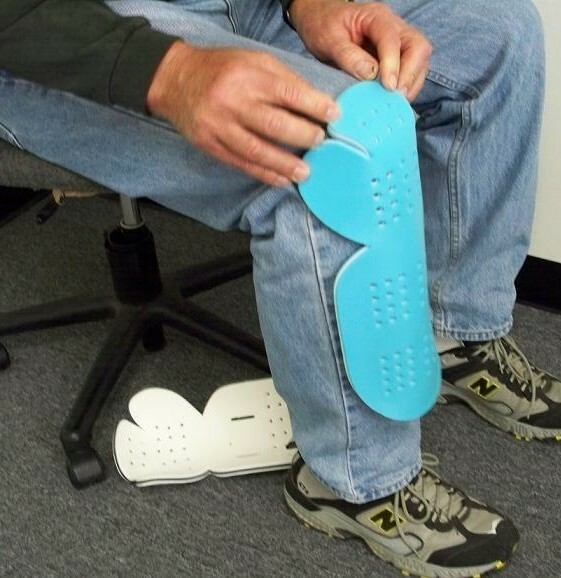 For riders that use both sport bikes and sit up straight style bikes with different foot peg positions, position the feet in the middle between the two different peg positions. Mark the jean with this middle position and the armor location should work ok for both bikes. The above measurements are mandatory for placing an order for any of our over pants. After we receive the above measurements, we will advise if any other measurements are necessary.